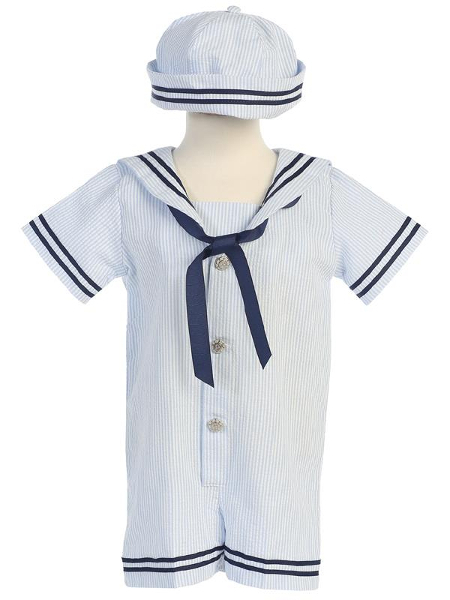 A sharp salute and it’s all aboard in this adorable sailor romper and jaunty cap for your wee ones. Cool and comfortable this is a wonderful outfit for those hot spring and summer days and a perfect compliment for a 4th of July celebration. 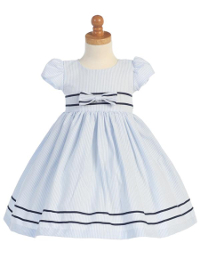 This romper comes in either white or light blue and is 100% cotton seersucker with contrasting navy blue accents. There are snaps at the bottom of the shorts for easy changing. Best of all, it is machine washable on cold, tumble dry and remove promptly. It is made in the USA by Lito. 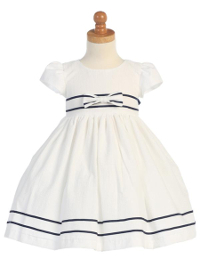 This little outfit is going to be discontinued this year so there are limited sizes and quantities in stock. Sizing Note: It does run on the small side so it is best to order up one size if your little one is at the top of his size range. See the general size chart for sizing. Allow 3 business days prior to shipment from the DapperLads store.